This Easy Thai Fried Rice Recipe comes bursting with the tastes and flavors of Thai cuisine and is ready in under 30 minutes! 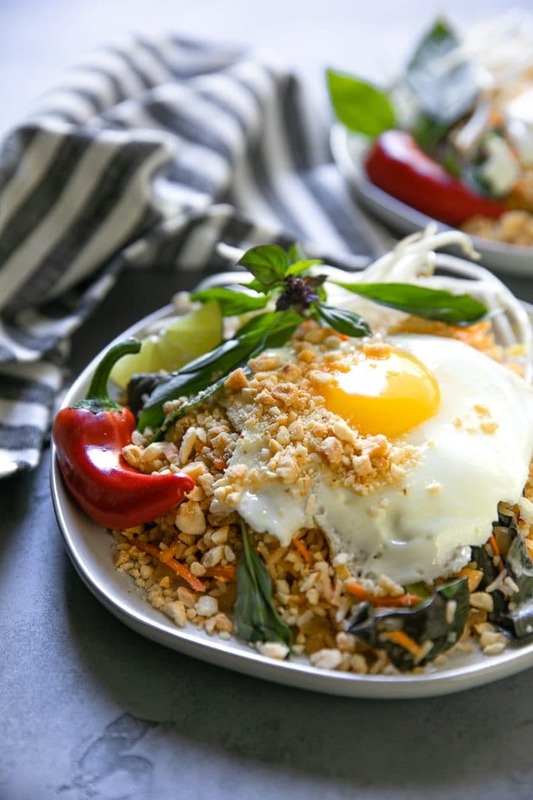 This version comes topped with a fried egg and cooked with fresh Thai basil leaves for a fun and delicious alternative to classic Thai Fried Rice. Riding around Koh Tao on a tiny motorbike and burning my leg on the exhaust pipe when it ran out of gas going up a hill (tip- never assume you have enough gas in your motor-bike to get you up a hill when it’s registering empty). Three dollar massages every single day. Delicious food everywhere, all the time and always served with a side of chiles in fish sauce. If you’ve ever been to Thailand, I’m going to take a guess that perhaps you experience half of these memories upon returning home. Perhaps not the exhaust pipe burn, but apparently it’s much more common than I realized, so really, who knows. No matter what your experience is like in this beautiful country, it’s impossible to leave Thailand without being impacted in some way by the food. Thai cuisine, in my opinion, is complicated. That’s not to say that it’s hard to cook, but good Thai food similar to that found from your favorite street vendor in Bangkok simply cannot be replicated. At least not exactly. Trust me, I’ve tried. Over and over and over. Fortunately, I’ve gotten very very close in several of the Thai dishes I have prepared, like this Thai Fried Rice, and remind myself that there’s a reason there are not more truly authentic Thai restaurants in my area. Ok, so anyway, Thai Fried Rice. Let’s have a little chat about this super easy, super simple Thai rice dish. First and foremost, let me answer some questions regarding this dish since I have a feeling they will be asked. Do you have to add the Thai Basil? No. 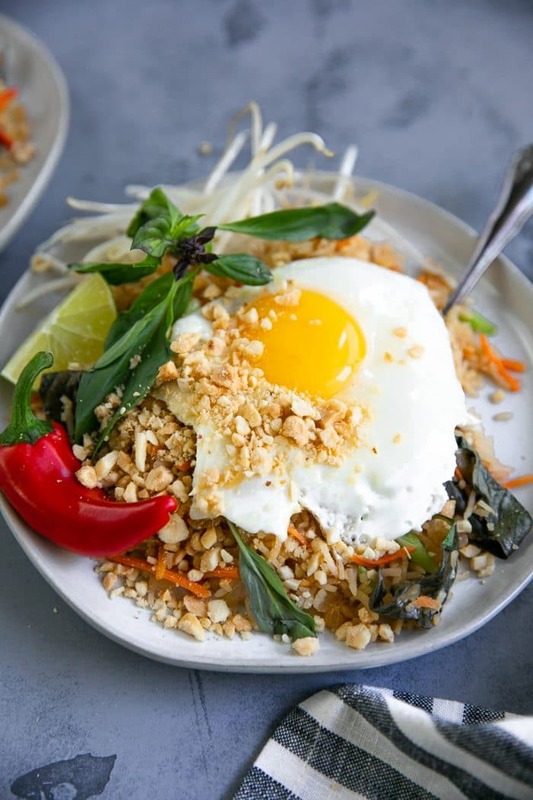 The Thai basil is not required for Thai fried rice. It is simply a variation from the alternative and since I happened to have some extra Thai basil laying around, I figured I would use it. Thai basil is not typically sold in regular markets, however, most Asian markets will carry it or you may be able to order it by special request. You hate spicy food. If spicy foods do not sit well with you, simply leave out all the spicy stuff. You don’t have to set your mouth on fire unless you want to. You’re vegan. If you are vegan and eat no animal products, this recipe may be a little tricky to modify, but definitely not impossible. While I have never tried this product for myself, I know you can replace the fish sauce with this Vegan Fish Sauce or try to make your own version at home. Also, no eggs. If, however, you’re looking for protein, tofu would be a fantastic addition. 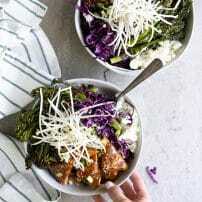 Can you make this with Cauliflower Rice? Yes. 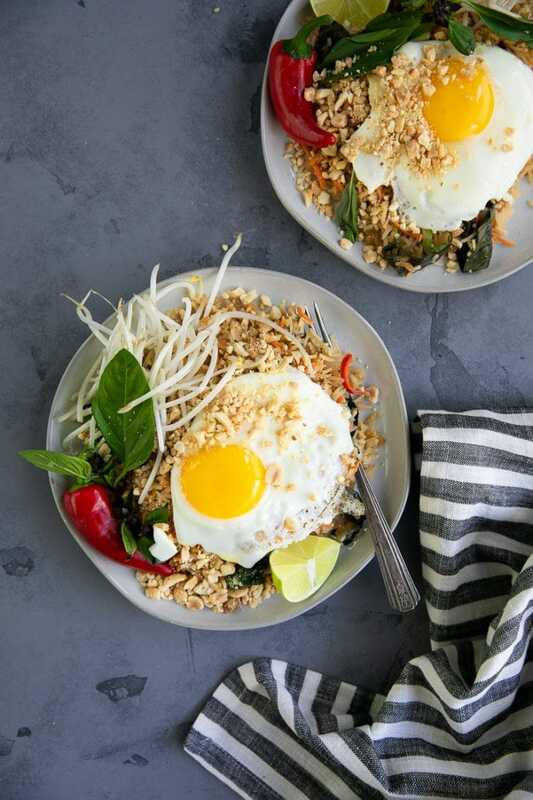 You can absolutely make this Thai Fried Rice recipe with cauliflower rice and you can learn how to make cauliflower rice here! Is this authentic Thai Fried Rice? Yes and no. Yes in that it has many authentic flavors and ingredients to Thailand, however, as with most of my recipes, it is a recipe all my own. 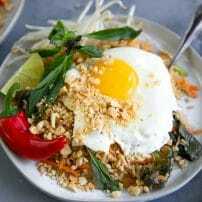 As with all fried rice recipes, this Thai basil version is easy and super fast. It’s also the perfect solution for all that extra leftover rice (if you’ve got any). I always, without fail, make too much rice. Fried rice is my favorite way to use it all up. The kiddos love it, too! Depending, of course, on how much chili you throw in there. It’s a great way to eat a ton of veggies. I’ll be honest- I didn’t add a TON of extra veggies to this rice because I wanted to keep it as “rice focused” as possible. With that said, don’t be afraid to toss in some bell pepper or zucchini, broccoli and cauliflower. Veg it up! You can totally add meat, too. Chicken, shrimp, beef. 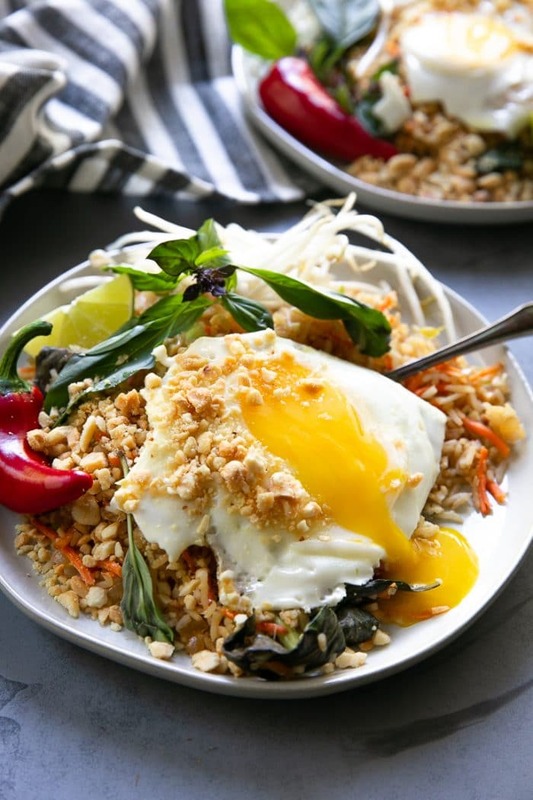 Anything goes with this Thai fried rice. 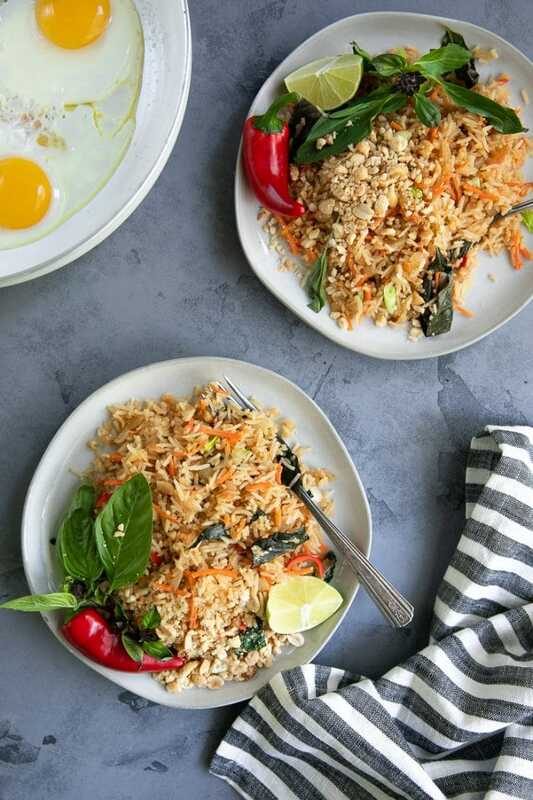 This Easy Thai Fried Rice Recipe comes bursting with the tastes and flavors of Thai cuisine and is ready in under 30 minutes! Thoroughly wash and rinse the rice until the water runs clean. Transfer to a large shallow pot and cover rice with water by approximately 2 inches. Bring water to a boil and cover. Allow rice to cook for 2-4 minutes. Uncover and taste the rice to see if it is cooked (all the water will not be absorbed- that’s ok). When rice is cooked, but not mushy (think al dente), immediately remove from heat, drain, and rinse with cold water to stop cooking. Set aside to drain. Heat olive oil in a large skillet over medium-high heat. Add chopped shallots to the skillet and sauté, stirring occasionally, for 4-6 minutes. Add the shredded carrots to the shallots and stir to combine. Cook for an additional 2-3 minutes. Add the Thai red chili, garlic, and fresh ginger to the shallots and carrots and stir to combine. Cook for one minute. Reduce heat to medium. Add the fish sauce, soy sauce, lime juice, green onion, and cooked rice to the skillet. Thoroughly mix to combine. For the eggs- either scramble together with the rice mixture or fry eggs on the side. Serve rice garnished with chopped peanuts, mung bean sprouts, and fresh chopped cilantro, if desired. Enjoy! 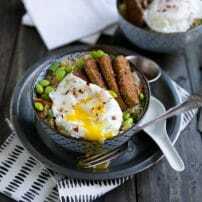 Want to try this Easy Thai Fried Rice Recipe? to your “30 Minutes or Less” or “Dinner Ideas Boards” on Pinterest and save it for later! This was a great easy recipe to go with our Thai fish cakes tonight. Great tasting and different to the Chinese fried rice I usually make. 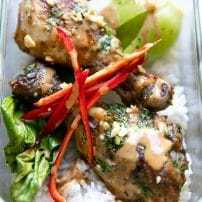 This will be the recipe I make every time I make a Thai style recipe. Thank you.